Let’s continue the Monarch butterfly (Danaus plexippus) theme by flashing back to a time several years ago when my best camera for photowalking was either an Apple iPhone or whatever camera gear I could borrow. A Monarch butterfly chrysalis was spotted on 02 September 2012 at the Patuxent Research Refuge, Laurel, Maryland USA. 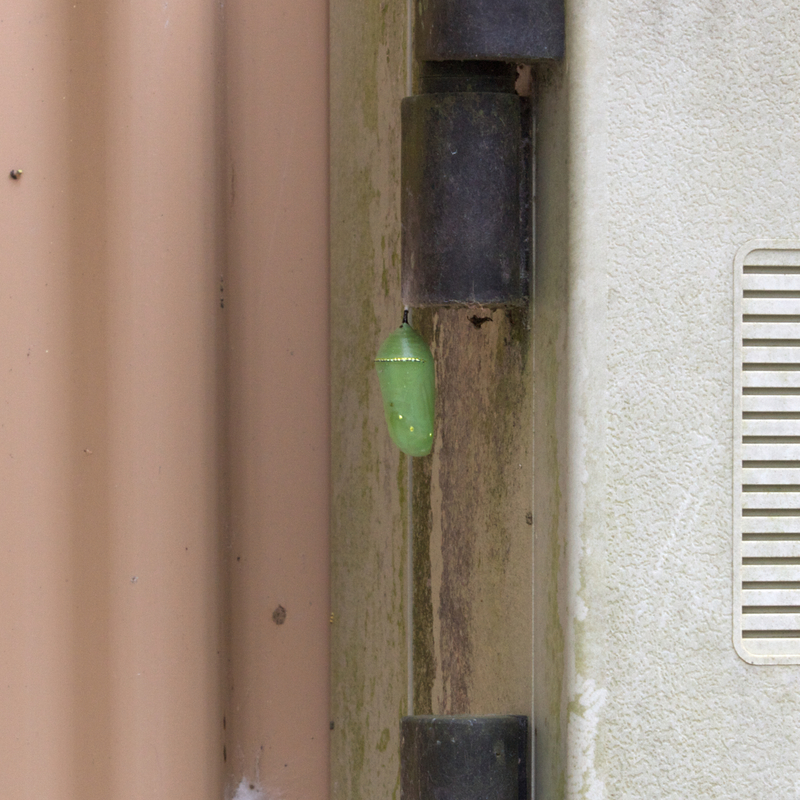 The chrysalis was attached to a telephone callbox outside the Visitor Contact Station, North Tract. The chrysalis was located near a bed of milkweed plants. I observed Monarch butterfly caterpillars (larvae) feeding on the same milkweed on 26 August 2012. The next image is a closer crop of the preceding photo, taken using a loaner Canon EOS Rebel XTi DSLR camera. A Monarch butterfly chrysalis casing was spotted during a photowalk on 09 October 2010 at the Children’s Garden at Hollin Meadows Science and Math Focus School, Fairfax County, Virginia USA. 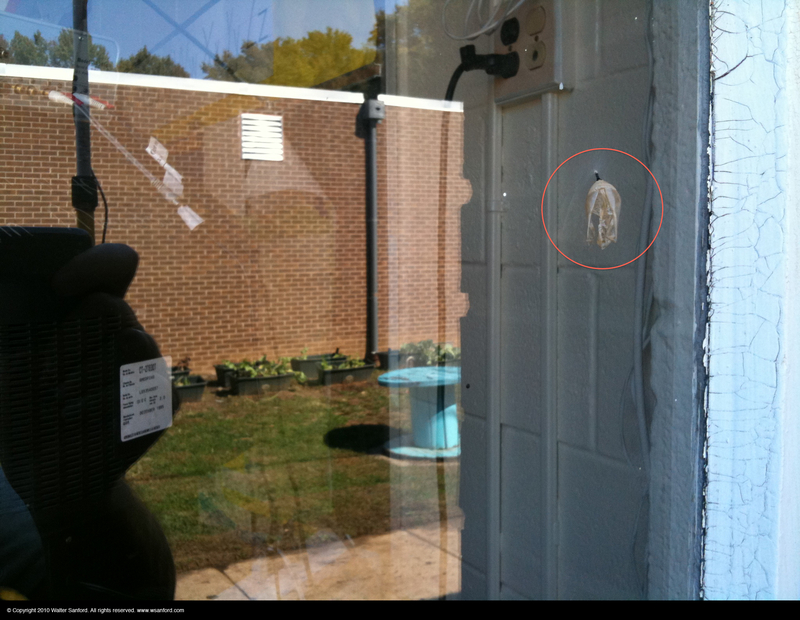 The chrysalis was attached to the outside of a classroom window near a planting of Scarlet milkweed (Asclepias curassavica). I observed Monarch butterfly caterpillars (larvae) feeding on the Scarlet milkweed plants during late August through early September 2010. Sometime later, during the pupal stage of its life, one of the caterpillars created a chrysalis on a classroom window in order to transform from larva to adult. 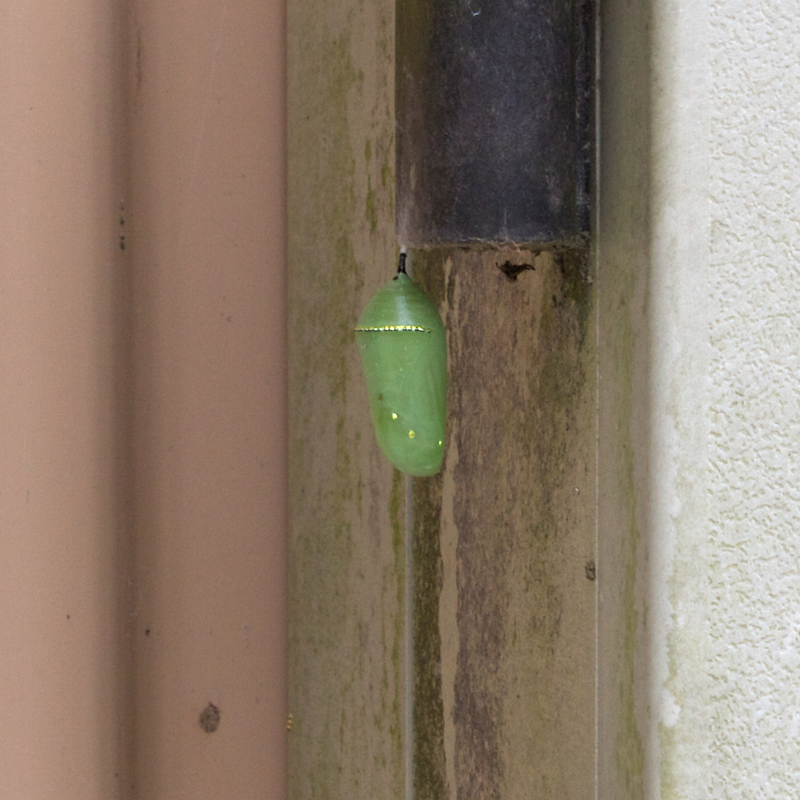 I discovered the empty casing after the adult Monarch butterfly had emerged from its chrysalis. The photo was taken using an Apple iPhone 3GS and annotated using Adobe Photoshop. This entry was posted on February 7, 2017 at 4:00 am and is filed under Aperture, Apple iPhone, butterflies and moths, Canon EOS XTi, digital photography, natural science, Photoshop, photowalking, wildlife photography. You can follow any responses to this entry through the RSS 2.0 feed. You can leave a response, or trackback from your own site.